Go ahead, judge this one by it’s cover. First of all. How gorgeous is this cover? I’m in love with the colors and design. Nice work Andrew Bannecker. Second of all. The story. Lovely. Heartbreaking. Uplifting. All the good things go into this story. Trent is starting 6th grade, which is hard enough for any kid. But six months ago Trent joined a pick up game of hockey, hit a puck into another kid’s chest (a kid who evidently had a heart condition), and that kid died. While a complete accident, Trent has not been able to forgive himself, and he’s pretty sure no one else has forgiven him either. 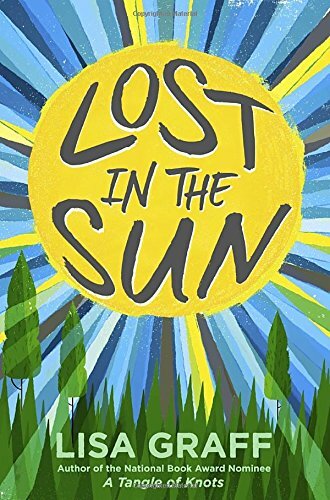 His former friends are shunning him, his new teachers hate him, and worst of all, his father thinks he’s a waste of space (or so it seems to Trent). It doesn’t help that anytime he picks up a baseball or a basketball or any other piece of sporting equipment, his hands get clammy and he can’t breathe. Then he meets Fallon Little, the girl with the horrible scar across her face, one that came either from a frisbee hitting her in the noggin, or a lightning bolt striking her, or being attacked by a soulless beast while scuba diving. Depends on which story she’s telling that day. Fallon is unlike anyone Trent has met before, and as much as he tries to dislike her strangeness, he can’t help but notice they way she laughs with her whole body and the way her smile tucks into the edge of her scar. And as much as Fallon jokes away her scar with extravagant storytelling, something happened there, something she doesn’t like to talk about. This story is packed with wonderful characters and honest emotions, a nearly perfect middle grade novel.